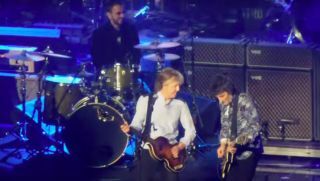 The blues legend joined the Stones onstage during their 'Steel Wheels' tour. In the ongoing—and always entertaining—"Ask Keith Richards" video series, someone posed a doozy to the legendary Rolling Stones guitarist:"Why do you hardly ever use guitar pedals?" The Rolling Stones' latest album, Blue & Lonesome, is a throwback to their earliest years when the blues was all that mattered to a young Keith Richards and Mick Jagger. Watch the Rolling Stones' Official Video for "Hate to See You Go"
The Beatles vs. the Rolling Stones was one of the great musical rivalries of the Sixties. Rolling Stones Tease New Cover of Little Walter's "Just Your Fool"
Amid all the news coverage of the Rolling Stones' latest album announcement, the band quietly posted a one-minute-long snippet of their new single, "Just Your Fool," last night. The Rolling Stones have released a brief snippet of music from their forthcoming album, their first studio release since 2005’s A Bigger Bang. Noisey’s Matt Sweeney interviewed the Rolling Stones’ Keith Richards for his Guitar Moves program last fall as the then 71-year-old rocker promoted his solo album, Crosseyed Heart. The Rolling Stones are working on a blues-themed studio album, and we know for sure that Eric Clapton will be making a guest appearance on the new disc.